One of my favorite ways to see a city is from above - nothing beats being up way high and getting a bird's-eye view of a city. 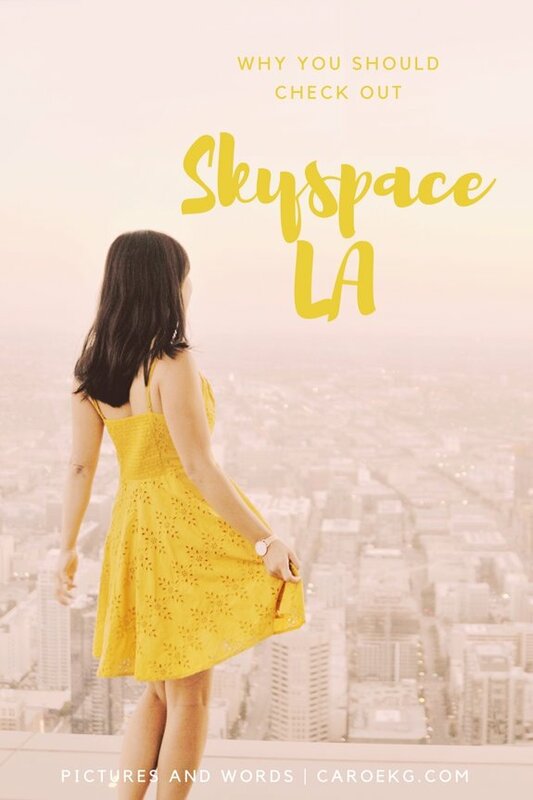 I was so excited when OUE's Skyspace LA opened, because it finally gave me a chance to see Los Angeles - my hometown - from up above. 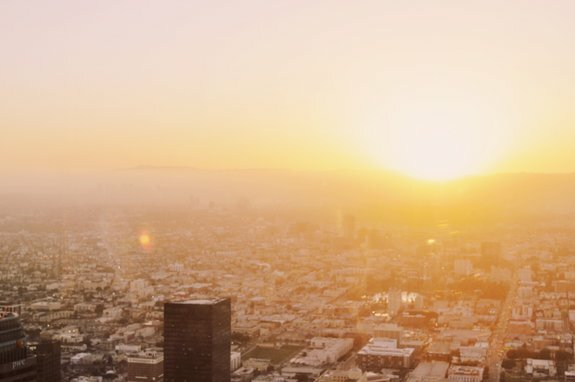 Perched on the top of the US Bank building, OUE Skyspace LA houses an observation deck, some interactive technological exhibits, multiple lobbies, and a cafe and restaurant/bar. For those seeking a bit of an adrenaline rush, it also features a 45-foot glass slide that goes down the side of the building. 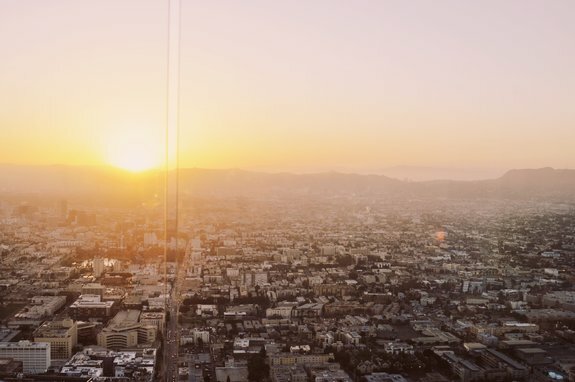 Your first stop at OUE Skyspace LA will be on the 54th floor, which is the Interactive Level. 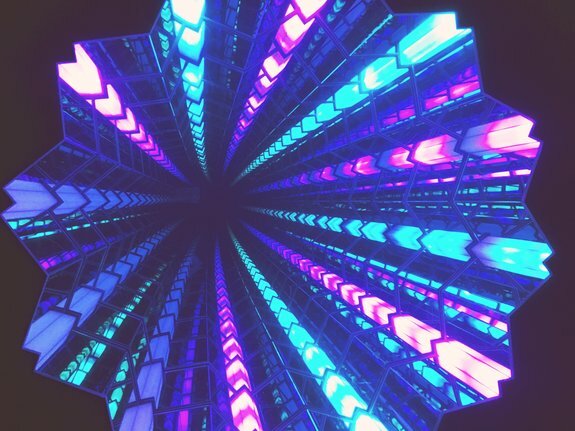 Here, you will find some a virtual reality time lapse of the view you are about to see from the top, some awesome light shows, and cool optical illusions, like one that looks like you are looking 54 stories down - so trippy! OUE Skyspace LA is located on the 69th and 70th floors of the iconic US Bank building, which stands 1,000 feet tall over downtown LA. It is the highest open-air observation deck in California. You won't find views like this anywhere else in the state! 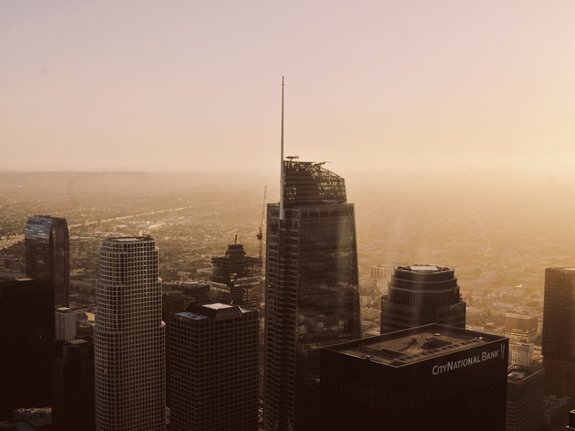 There are two decks here that give you unparalleled 360-degree views of downtown LA, the valley, the San Gabriel mountains, the ocean, and everything in between. On a clear day, you can see up to 34 miles! 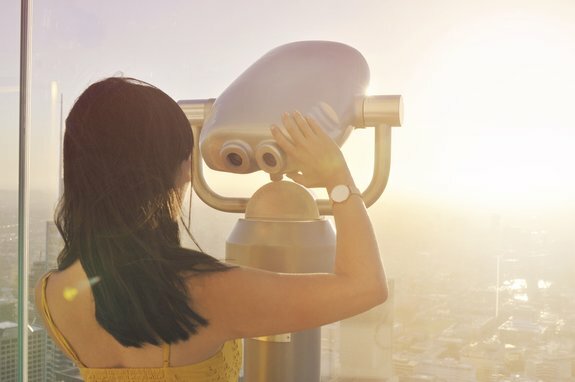 The observation decks also provide free telescopes so you can REALLY get a great view. 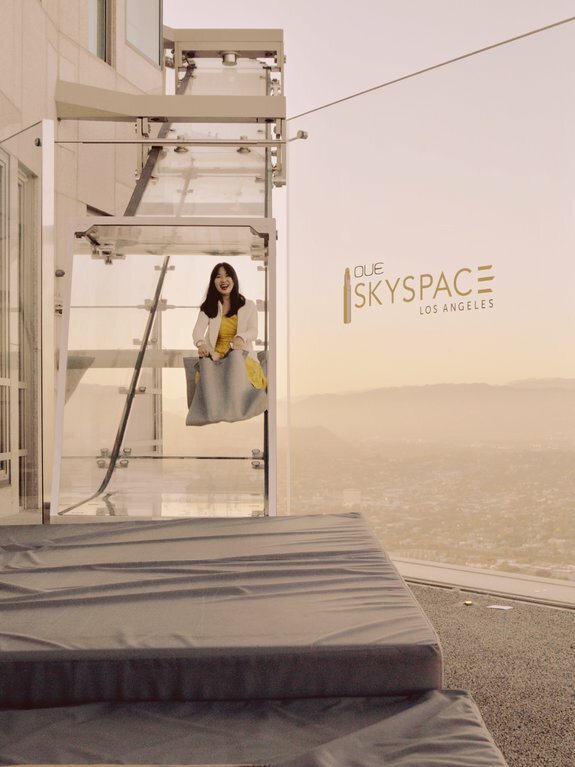 When you buy tickets to OUE Skyspace LA, you also have the option of purchasing an add-on to ride down the Skyslide, which takes you on a 45-foot long, 4-feet wide, 1.25-inch thick glass slide that gives you a view of the LA skyline while going down from the 70th to 69th floor. It goes by in a flash so make sure you remember to look outside at the view! 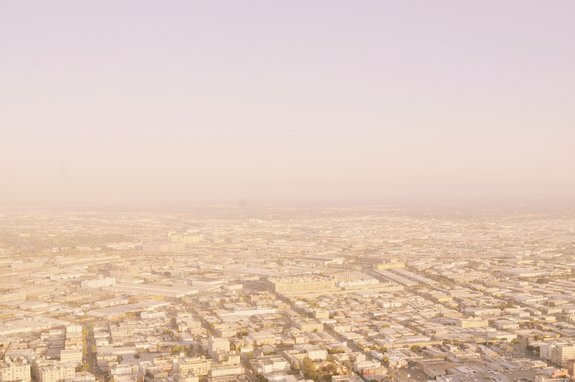 LA is notorious for its smog, but one great thing about all that smog? It results in some pretty epic sunsets. There's nothing better than seeing it from 1,000 feet above ground. Seeing the sun fall below the horizon while perched up so high was one magical sight. 6. It's still new-ish and not too crowded - yet! 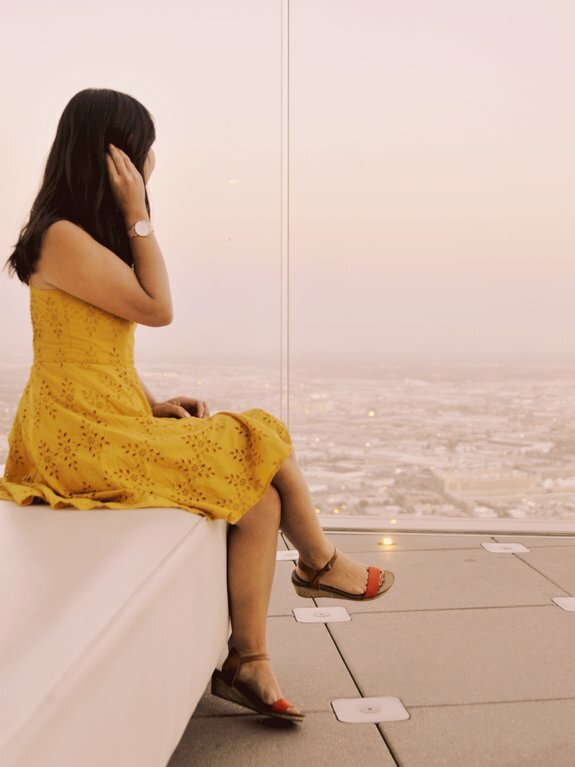 OUE Skyspace LA opened in summer 2016, so it is still pretty new. It seems that not too many people have heard of it yet, because it wasn't packed at all (unlike when I went to Skydeck in Chicago). Now is the perfect time to check it out, before everyone starts to hear about it! Parking is available across the street at the Westlawn Parking Garage, located at 524 S. Flower Street Los Angeles, CA 90071. The P7th Street/Metro Center and Pershing Square Metro subway stops are also located a few blocks away. Sunday through Thursday: Opens at 10am; last ticket sold at 9:00pm. Friday and Saturday: Opens at 10am; last ticket sold at 10:00pm. You can also purchase flex admission, which is valid for any time for an additional $5. Add $8 for Skyslide add-on. Tickets may be purchased in-person at the box office on the 2nd floor, or you can buy tickets only here. Do you like seeing a city from high up above? Photos of me: Photos of me by Melissa Teng. All other photos by me. 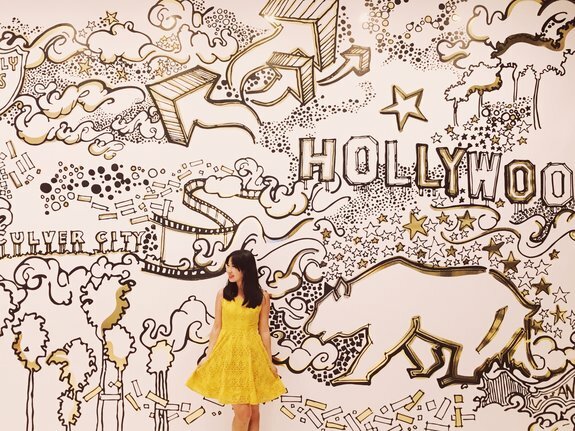 This is definitely a place I would love to visit in LA! 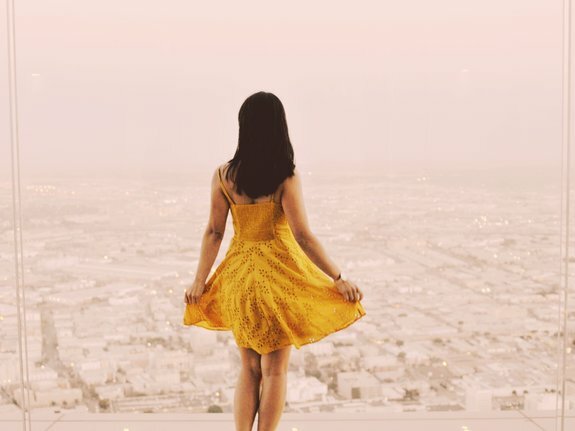 I love a good viewpoint to see the city and sunset, so this seems like the perfect place for that. Thank you for sharing it, I will be adding this to my bucket list of LA. Loving this pics. I want to go although that height might scare me down to my spine. haha. Really artistic pictures! I love the lighting and your dress. I also love the art installations there. Very cool. I completely agree that the best way to see a city is from above, it gives you a whole new perspective on the city! Next time I'm in LA I'll definitely have to check this place out! OMG... This is absolutely stunning! I love bird-views... This is so much my place! This looks like a great way to see the city! Love your pictures. I haven't been to LA yet, but I am dying to go! Wow those are some amazing views from the sky deck! And a slide?! That is pretty awesome! Lovee the photos! I wish I knew about this while in LA last year, would have seen so much more! As many times as I've gone to LA to visit family - I have never gone to this! Looks like you can get awesome views from here! Looks like a lot of fun! I travel to LA frequently, and have not visited Miami in years…might be time to do so!